This is one of the dishes that I made for the engagement party scene in 'Cabaret.' In the scene, the counter is covered in party food; punch, sausages, St. Lucia rolls, fruit bowls, and pickled herring. 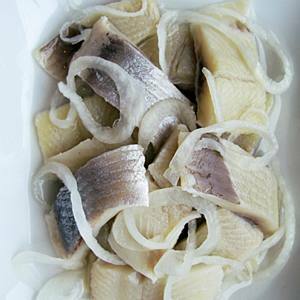 This pickled herring is made of a material newly discovered to me- paraffin wax. Well, okay, I knew about paraffin wax before, but the idea of using it to replicate translucent foods is on the newer side. My boss suggested it last season for a smoked salmon platter that was on the list, and I decided to use it for this project. The paraffin is nice because it is easy to carve with an olfa knife or carving tools, easy to tint with candle coloring, has a great translucence for things like fish, and you can buy it at the grocery store. Also, you can melt it down for re-use. I started by finding a few research photos. Okay, the shameless promoting is over for now. After buying the pigments, I carved the paraffin wax into pickled herring shapes. I carved the shapes with my trusty Olfa knife, and used a clay carving tool to smooth them. Once the shapes were carved, it was time to add some color. Using a makeshift double boiler (tin cans in a bath of boiling water) I made three wax washes; one yellow, one gray, and one black. The yellow was just to cut the bright white color of the wax, the gray and black were to give the appearance of skin. Keeping the colored wax warm and liquid, I used acid brushes to paint it onto the pieces of "herring." Once the herring was finished, it needed some garnish to make it believable. The dill was easy, I just pulled some plastic fish tank plants out of our stock. The onions were more fun. I cut microfoam packing material into thin strips, and glued it into rings using rubber cement. Once I had herring, onions, and dill in hand, I just had to glue them down. I used a combination of hot glue and rubber cement to do this. Turns out, rubber cement doesn't stick to wax, and hot glue doesn't stick to microfoam. Fun, no? Anyway, once it was all together, I was very happy with the effect.